SEND IN YOUR BEST SHOTS—West Coaster, San Diego’s craft beer magazine, has announced its first contest in the publication’s two and one half year history. February 2013 will be the first ever West Coaster Photo Issue. The theme is California Craft beer. Submit your best shots (high resolution, please) of CA bars, beers, brewers, breweries or whatever else you associate with California’s craft beer culture. Images must be greater than 300 dpi. Again, the deadline is Monday, January 14 at 5 p.m. Prizes will be awarded for the top images. 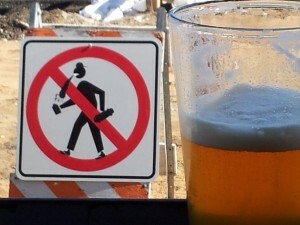 Todd Elvins from Del Mar sent in this photo of an “enhanced” no pedestrian crossing sign outside Pizza Port Solana Beach on the last day of San Diego Beer Week 2012. The beer in the glass is Swami’s IPA.